Watch video from AGRINATURA Science Days: How will agriculture look in 2030?! The AGRINATURA Science Days are organized by AGRINATURA, hosted by the University of Natural Resources and Life Sciences, Vienna, in cooperation with Caritas Austria, ADA (Austrian Development Agency), KEF (Commission for Development Research) and VIDC (Vienna Institute for International Dialogue and Cooperation), taking place from 5 to 7 May 2014. 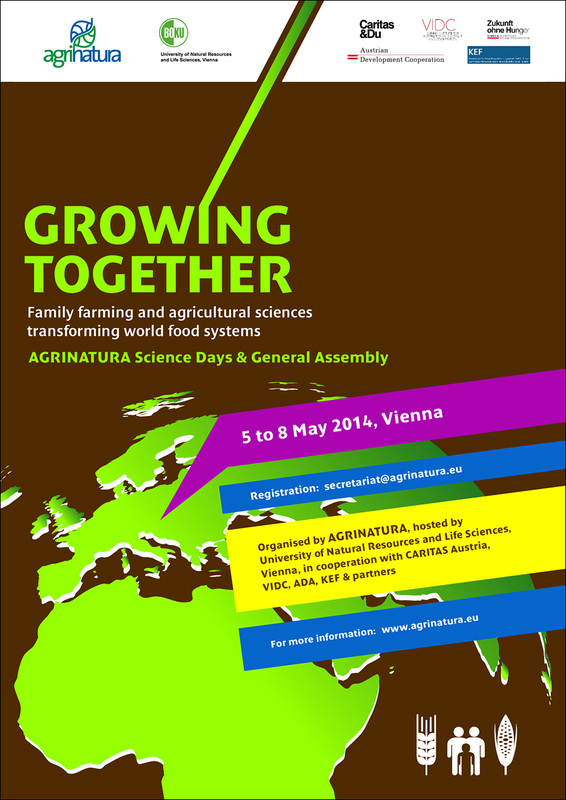 The AGRINATURA General Assembly is held on 8 May 2014 at the University of Natural Resources and Life Sciences, Vienna; participation by invitation only. World food systems are undergoing ecological, economic, social, and structural transformations. Some transformations offer new opportunities for small-scale family farmers, others cause uncertainty, poverty and hunger: Although small-scale farmers grow food for consumers and markets, many farmers themselves suffer from hunger and precarious livelihood conditions. At the AGRINATURA Science Days we ask if and how alliances between small-scale family farming and agricultural sciences can transform local and global food system in ways that ensure food and nutrition security at all levels. We also ask how research and higher education become more effective in understanding and supporting transformations that bene it family farming, world food security and wellbeing. And we explore how an emerging transformative change agenda its into the Post-2015 development framework. The AGRINATURA Science Days assemble researchers and practitioners concerned with family farming, food security and transformative change in one single forum. They offer a unique opportunity for dialoguing, learning, networking and exploring new research and higher education partnerships. Results of the Science Days contribute to the AGRINATURA strategy and support the International Year of Family Farming. The working language during the Science Days is English. Interpretation to other languages is not available. 13.30 – 15.00 Keynote and dialogue l Small-scale family farming and food poverty: Achievements and the unfinished agenda. 15.30 – 16.30 Stories from the field l Small-scale family farming and agricultural research: learning from transformative change that benefits food, income and the environment. 10.00 – 12.30 Parallel stream 3 l Partnerships and transformative learning alliances of food system actors. 09.00 – 17.00 AGRINATURA General Assembly l for delegates only. Adipala Ekwamu: Small-scale family farming and food poverty: Achievements and the unfinished agenda. Lise Andreasen: From agro-ecological research project to agro-ecological research platform? Univ.-Prof. Dipl.-Ing. Dr. Dr. h.c. mult. Martin H. Gerzabek studied agriculture at the University of Natural Resources and Life Sciences Vienna (BOKU) and graduated 1985. 1987 he received the doctor of agronomy. He was vice rector for research of BOKU from 2003 to 2010 and since 21.1.2009 until 31.1.2010 he is acting rector of BOKU. Gerzabek leads and led numerous national and international scientific projects. He published more than 400 scientific papers so far and is corresponding member of the Austrian Academy of Sciences. He holds numerous functions in scientific and learned societies as e.g. in the Danube Rectors’ Conference, ICA-Association for European Life Science Universities etc. Josef Glössl is vice rector for Research and International Research Collaboration since 2010 and full Professor of Applied Genetics at the University of Natural Resources and Life Sciences, Vienna. He graduated in Biology and Biochemistry at the University of Graz, Austria. In 1979 he received his Ph.D. degree at the same university. His research interests are in cell biology, genetics, glycobiology and biotechnology of animal and plant systems, he published more than 100 papers in SCI journals. Since 2010 he is President of the Austrian Association of Molecular Life Sciences and Biotechnology (ÖGMBT). He is a full member of the European Academy of Sciences and Arts, class Natural Sciences. Christoph Schweifer is Secretary General for International Programs at Caritas Austria since 2005. Caritas Austria is one of 165 members of the Caritas-Internationalis-Network and focuses on fighting worldwide hunger. Mr. Schweifer is active in awareness-raising and in the creation of public commitment concerning the promotion of the fight against hunger, for example: He is member of the steering-group of the Caritas-Internationalis-Campaign “Food for all”. Moreover, he was one of the panel members of the “First Humanitarian Congress in Vienna”, held in October 2011. Mr. Schweifer was also the initiator of the congress “Future without Hunger” in 2012. Furthermore, in 2013, Caritas Austria organized the Pastoralist Knowledge Conference in Kenya, where Mr. Schweifer was one of the keynote speakers. Adipala Ekwamu graduated with M.Sc.in Agriculture in 1980 from Makerere University. He obtained a Ph.D. degree (Plant Pathology) from The Ohio State University (USA) in 1992. He is the current Executive Secretary and Chief Executive Officer for RUFORUM. Adipala worked at Makerere University since completing his B.Sc. Agriculture degree, rising to the level of full Professor in 1998. During this period he led several University and national strategic planning committees. He served as a Board member to 3 Ugandan Government Statutory Bodies (1981-1986), 2 Non-Governmental Organisations (2001 to 2006), and several national planning committees. At Makerere University served in several University leadership positions, heading 2 university wide committees, a Competitive Grants Program, and Chair of the Makerere University Publication Committee. He initiated and coordinated several research programmes/projects, and is accredited with releasing three varieties (of cowpeas and soybeans). He founded the African Crop Science Journal and African Crop Science Society Conference Proceedings publications in 1993, and served as Editor-in-Chief for 10 years. He has over 180 peer reviewed journal publications. He serves on several international committees including the Advisory Committee for the International Foundation for Science, DFID and Technical Centre for Agricultural and Rural Cooperation. Rahel Wyss is assistant in socio-economy in the Department of International Agriculture at the Bern University of Applied Sciences, School of Agricultural, Forest and Food Sciences (HAFL) in Switzerland. She provides assistance to teaching in the field of international agriculture and is supporting diverse mandates and project activities in the field of ARD. In parallel, she is currently enrolled in the Master’s program in Applied Agricultural and Forest Sciences at HAFL and is doing her research in a project on seed systems and food security in Burkina Faso. In 2012 she has carried out her field assignment to complete her BSc studies in International Agriculture in Northern Vietnam on an economic analysis in the field of Rural Development. Since 2013, she is YPARD Swiss representative engaged in activities to facilitate and promote the entry of young professionals into research and development in the field of environmental and agricultural sciences. Patrick Dugan is Deputy Director General of the WorldFish Center. In this role he leads the CGIAR Research Program on Aquatic Agricultural Systems (AAS). He reports both to the Director General of WorldFish and the Chair of the AAS Program Oversight Panel. Patrick joined WorldFish in 2000. He served initially as Deputy Director General for Africa and West Asia, based in Cairo, Egypt, and subsequently as Deputy Director General responsible for overseeing implementation of the Center’s research strategy. He moved to Penang in January 2009. Prior to joining the CGIAR Patrick held several positions with The World Conservation Union, the most recent being Global Program Director based in Switzerland. Over the course of his career, Patrick has worked extensively in Africa, Asia and Latin America, and has served as advisor to several international organizations. These include the Global Environment Facility, the Mekong River Commission, the New Partnership for Africa’s Development (NEPAD), the Organisation for Economic Co-operation and Development’s Development Assistance Committee (OECD-DAC), the Ramsar Convention, the United Nations Environment Programme (UNEP) and the World Commission on Dams. Judith Ann Francis is Senior Programme Coordinator, Science and Technology Policy at the Technical Centre for Agricultural and Rural Cooperation ACP-EU (CTA), The Netherlands. She is presently the Executive Secretary of the European Forum on Agricultural Research for Development (EFARD) and a member of the International Advisory Panel of the Regional Universities Forum for Capacity Building in Agriculture (RUFORUM) in Africa. She also sits on the board of SciDev.net www.scidev.net. Since joining CTA in 2003, Judith has been responsible for promoting science, technology and innovation (STI) for agricultural and rural development (ARD) in the 79 African, Caribbean and Pacific (ACP) Group of States. She has championed innovation systems and the application of the innovation systems approach, foresighting, women scientists and young professionals, increasing investments in research and innovation and strengthening the engagement of research and academic communities in STI policy processes. Christian Hoste is Engineer in agriculture (Lille, France), holds a Ph.D. in Animal Genetics (Leuven, Belgium) and a French State Doctorate in Natural Sciences (Paris, France). His experience includes 17 years on livestock research and development in sub-Saharan Africa and 18 years in agricultural research organization and management. Christian contributed for 3 years to the building-up of the Global Forum on Agricultural Research (GFAR) in FAO, Rome and then went back to France to work for CIRAD, the French Agricultural Research Centre for International Development. During that assignment, he became Director of the European Consortium for Agricultural Research in the Tropics (ECART) and facilitated its evolution into AGRINATURA to become the main European operator in agricultural research and higher education for development. He also initiated and coordinated an EC-funded ERA-NET on agricultural research for development (ERA-ARD). Since May 2010, Christian is Deputy Director and Director of International Relations of Agreenium, the new French consortium for Research and Education in Agriculture, Food, Animal Health, and the Environment. Carolyn Glynn Swedish University of Agricultural Sciences (SLU) Associate Director http://www.slu.se/slu-global Carolyn Glynn is Associate Director for the program Agricultural Sciences for Global Development; SLU Global and Senior Researcher at the Department of Crop Production Ecology. SLU Global is a platform for research, education and capacity building with focus on four thematic areas: Efficiency in farming systems, Restoration of degraded rural landscapes, Scale issues in relation to food security and poverty alleviation and Urban and peri-urban farming. Martin Ledolter is a legal expert who has spent most of his professional life in politics, notably serving as a senior political advisor to the Vice Chancellor and Minister of Foreign Affairs in the Cabinet of the Austrian Foreign Ministry in the areas of development cooperation, social and health affairs. Previous assignments included postings as Senior Political Officer in the Austrian Employees’ Association (ÖAAB), as Parliamentary Group Secretary of the Austrian People’s Party, and assignments with a number of law firms.Martin Ledolter regularly lectures in International Corporate Health Law for postgraduate students at the University of Applied Sciences IMC Krems, Austria, and is a regular guest lecturer at the Vietnam University of Commerce in Hanoi. In July 2013, Martin Ledolter was appointed as Managing Director of the Austrian Development Agency (ADA), the operational unit of the Austrian Development Cooperation. In this position he is responsible for the implementation of all bilateral programmes and projects of the Austrian Development Cooperation (ADC) in eleven partner countries in four continents. Sunil Simon is environment professional with specialisation in natural resource management. He has more than 13 years experience in academics, development and industrial sectors. He is associated with Caritas India since 2007 and currently working as South Asia Programme Manager under the Strengthening Adaptive Farming in Bangladesh, India and Nepal (SAF-BIN). He is also the regional resource person of Caritas International on Food Security for Asia and a member of the “Reference group on Food Security and Climate Change”. He has been part of the civil society campaign to declare 2014 as the International Year of family Farming. He is interested in working on issues of food security and climate change of smallholder farmers. Lise Andreasen coordinates ICROFS international research related activities outside Europe. She is responsible for preparation and implementation of transnational research activities – from development of research agenda to implementation, dissemination and evaluation – as well as initiatives to promote research in organic food and farming systems. For more than 20 years she has worked with development and research projects in Africa, Asia and Europe. With a background in environmental economics, agriculture, and international business administration her work has mainly been in the field of farming systems development, sustainable agriculture and participatory approaches to natural resource management. Abstract: From agro-ecological research project to research platform? Senior Scientist, Director, Dipl.-Ing. Dr.
Michael Hauser is an agro-ecologist by training. Over the past ten years, he worked on sustainable agriculture, natural resource management and livelihood transition, largely in sub-Saharan Africa with some exposure to Asia. He is director of the Centre for Development Research, University of Natural Resources and Life Sciences, Vienna. A central research focus has been on innovation and change processes in agriculture. He conducts graduate and post-graduate courses on livelihood systems and participatory methods. He further offers course on development innovation and development research. He is president of AGRINATURA – The European Alliance on Agricultural Knowledge for Development and board member of the Commission for Development Studies in Vienna. Sarah Mayanja is a Research Associate with the International Potato Center (CIP) in Uganda. She has over 20 years’ experience in promoting agricultural trade development in East and Central Africa. Her passion is improving smallholder farmers’ access to equitable and diverse markets through facilitating development of gender transformative agricultural trade networks. She works closely with farmers in her work with CIP and understands their market access challenges firsthand. She is currently completing her MSc. Patrick CARON holds a PhD in veterinary sciences and development geography. His work relates to livestock systems and territorial dynamics, in particular to the role of territories in rural change, notably in Brazil, southern Africa and the Near East. He published more than 100 articles in international journals and is CIRAD Director General since 2010, having previously been Scientific Director of “Territories, Environment and People” department from 2001 to 2004 and Director of “Environment and Societies” department from 2007 to 2010. He is a member of numerous institutional and governance bodies. Richard Hawkins is a graduate from the University of Nottingham, UK (1979) with a PhD on maize growth and temperature in Kenya. After working as a Crop Physiologist in Central America, and as Farming Systems Research Advisor in Nepal and Indonesia, he joined the International Centre for development oriented Research in Agriculture (ICRA) in 1990, becoming ICRA’s Director in 2012. He can be contacted via richard.hawkins@icra-edu.org. Bebe is associate professor of livestock production currently serving in the position of deputy director of extension and outreach at Egerton University. He holds a PhD and MSc in animal science from Wageningen University and obtained his BSc degree from Egerton University in Kenya, where he has been an academic for over 20 years. His research focuses on smallholder dairy and pastoral milk production systems and adaptation to climate change and variability. He is chair of postgraduate curriculum in the department of Animal Sciences at Egerton University. He jointly with several partners developed project funded by ACP-EU with the objective of deploying Interactive On-line Networking Platform for Improving Quality and Relevance of African University Graduates to Labour Markets. Dr. Erhard Hoebaus studied Zoology and Biochemistry at the University of Vienna (Dr. phil., 1977) and European Food Regulatory Affairs and at the University of Ulster (2006). He has been working as pre-doc scientific assistant and scientific assistant at the University of Vienna, Head of Division for Viticulture, Pomiculture and Horticulture at the Federal Institute of Plant Protection, Vienna. Dr. Hoebaus is now working for the Ministry of Agriculture, Forestry, Environment and Water Management, first as Head of Division of Austrian Federal Offices and Institutes for Agriculture. Since 2002 he is Head of Division of Nutrition and Quality Assurance and is responsible for “Regions of Delight” from the outset. Director Andrew Westby is Director of the Natural Resources Institute of the University of Greenwich since 2010. He worked at NRI for 26 years and was previously Director of Research and Enterprise for 9 years. He was promoted to Professor of Food Technology in 1998. His research has focussed on the post-harvest and marketing issues of tropical root and tuber crops specifically, cassava, sweet potato and yam. Since 2008 he has led the Cassava: Adding for Africa Project funded by the Bill and Melinda Gates Foundation. The project has been funded for a second phase from 2014-2019. Through the capacity strengthening activities of NRI, leadership has been transferred to an African organisation and Andrew continues to play a senior advisory role. Cooperation for Development and Internationalisation Coordinator. Filipa Sacadura has a background in Animal Science but most of her professional life has been dedicated to the areas of Innovation, Technology Transfer and Entrepreneurship. Filipa works at INOVISA, a Portuguese non-profit association focused on Innovation, Technology Transfer and Entrepreneurship in the agricultural, agrifood, forestry, landscape and environmental sectors, where she coordinates the areas of Technology Transfer and Cooperation for Development and Internationalisation. In 2011, Filipa was responsible for the implementation of Rede INOVAR, the Portuguese Network for Innovation and Technology Transfer, coordinated by INOVISA, and has been involved in this network since then.Since 2013, Filipa has been supporting the definition and implementation of the SKAN Platform, an initiative/network that aims at promoting the sharing of knowledge and technology between Europe, Africa and Latin America in the agricultural, food and forestry sectors, being INOVISA the project manager. This initiative will be presented at the AGRINATURA Science Days, in Vienna. Luís Mira da Silva is Associated Professor at the School of Agriculture/University of Lisbon. He has a PhD in Agricultural Systems from the University of Reading (UK), and an Executive MBA from London Business School/University of London. His lecturing and research interests cover innovation, entrepreneurship, planning and management in the agro-food sector, and ICTs. He is Vice-president of the School of Agriculture and President of INOVISA. In the last 15 years he participated in the creation of six technology based startups. Since 2010, he has developed several initiatives to build links between the University and the private sector, including a national technology transfer network and an international (Europe, Africa, Latin America) sharing knowledge platform. Nikolaus Morawitz is Director (Abteilungsleiter) responsible for Presidium matters as well as EU and international relation at the Austrian Chamber of Agriculture. He looks back at more than 20 years experience in European Agricultural Policy having served for 13 years as representative of the Austrian Chamber of Agriculture in Brussels. Paul Kibwika is an Associate Professor and Chair of the Department of Extension and Innovation Studies in the College of Agricultural and Environmental Sciences, Makerere University. His specialty is Agricultural Extension and rural development with special interest in innovations in Higher Education institutions. He led the development of a regional PhD programme in Agricultural and Rural Innovation and is coordinating its implementation by consortia of African and European universities. Francois joined FARA (Ghana) in 2007 as communication manager and is since 2010 co-managing the FARA-AGRINATURA multi stakeholder platform with the acronym PAEPARD out of the CTA office in Brussels. He has a career of 25 years in development cooperation, spent some 10 years in Africa, and holds consecutive masters in Social work, African History, Philosophy of Science, and Development administration. He worked for the Cabinet of the Belgian Minister for Development cooperation, the Flemish interuniversity cooperation, Medecins sans Frontieres and UNDP. Maria Wurzinger is a senior scientist at the Department of Sustainable Agricultural Systems and co-director of the Centre for Development Research at BOKU – University. She investigates different aspects of livestock production systems. In her research she combines farmer´s knowledge with scientific knowledge for the development of community-based breeding strategies for smallholders.More recently she started to work on agricultural innovation systems and identification of most promising intervention strategies in low-input systems. Florent Okry studied Agricultural sciences and obtained an Engineer and Master degrees. He got his PhD as agricultural anthropologist from Wageningen University. He has keen interest in local knowledge and development dynamics. Over the past years, he worked on rural Learning and Innovation systems, evaluated interventions dealing with farmer-to-farmer training videos and supported multi-stakeholder projects. Currently he is the Regional Coordinator West & Central Africa of Access Agriculture and leads the project “Videos for Farmers” implemented in Benin, Egypt, Kenya, Malawi, Mali and Uganda. He also offers courses in Rural Sociology and Extension at the Agricultural University of Kétou (Benin). Jantien Meijer coordinates CABI’s partnership development efforts in Europe, developing business activities with key partners to improve people’s lives worldwide by applying scientific expertise and providing information to solve problems in agriculture and the environment. CABI is an inter-governmental, not-for-profit organization with 48 member countries. Jantien has a background in sustainable development and experience in certification, international project management, stakeholder engagement and training and fundraising. She studied Rural Development at Wageningen University, with a specialization in international political relations at the University of Amsterdam. Previously she worked for Fairtrade International, Fair Wear Foundation and Clean Clothes Campaign. Senior Scientist – Dipl.-Ing. Dr.nat.techn. Andreas Melcher is senior scientist and lecturer at the Institute for Hydrobiology and Wate management at the University of Natural Resources and Life Sciences in Vienna (BOKU). His work is focused on functions, processes, and structures of aquatic ecosystems and their environment – in particular ecological assessment methods, fisheries management and climate change effects. As a partner of the BOKU Centre for Development Research (CDR), the interest of research and project management also include capacity building and socio-economic aspects in the South, countries such as Burkina Faso, Ethiopia, Kenya, Uganda and Iran. One particular aim is to be engaged in implementing interdisciplinary research into practice. This expanding scope of a cross over applied research has naturally incorporated ecological cause effect analyses, adaptive system analyses, social and gender aspects. Sabine Homann-Kee Tui is trained on dryland farming systems. For more than 10 years she has worked on market-oriented technology development, sustainable intensification of crop-livestock systems and participatory research approaches in Sub-Saharan Africa. She works for the International Crops Research Institute for the Semi-Arid Tropics (ICRISAT) in Zimbabwe, where she gained experience also on resilience concepts, innovation processes and facilitating multi-stakeholder forums. Her current focus is on resilience and profitability of small-holder farming systems, how multi-stakeholder forums can promote desirable change, and about the consequences of market-oriented development on women’s control over households resources and income. Sukleash George Costa holds a post graduate degree in business administration. He is trained in facilitation, advocacy, community organization and adaptation to climate change. During the last 6 years he has been working on adaptation to climate change, livelihood development, entrepreneurship development and adaptive research approaches in drought prone and semi-arid areas in Bangladesh. His work concentrated on food and nutritional security, adaptive technology development and he has gained experiences with resilience concepts and innovation processes. His current focus is on blending farmers and multi stakeholder innovations and practices in adaptive smallholder farming systems in rain-fed areas of Bangladesh. Virchow is the Executive Secretary of GlobalHort and serves as the project coordinator for the research program “Improving food security in Africa through increased system productivity of biomass‑based value web” at the Center for Development Research Bonn from the University of Bonn. He holds a PhD in agricultural economics from the University of Kiel and formerly worked as the Director of the Regional Center for Africa of AVRDC in Tanzania, as a Senior Project Manager at InWEnt, as a senior research fellow at the Center for Development Research ZEF and as Head of the agricultural department of the Evangelical Lutheran Church of the DR Congo. His research areas are food security, rural and regional development, horticulture for development as well as natural resource management. Doris Herrmann is head of research, consulting and further education at the School of Agricultural, Forest and Food Sciences HAFL (Bern University of Applied Sciences). She holds a PhD degree in natural sciences from the University of Zurich and a degree as engineer of agriculture of the ETH Zurich. Before joining HAFL, she was for four years the program manager of the Indo-Swiss Collaboration in Biotechnology (ISCB), a bilateral research and product development program working in the field of agricultural and environmental biotechnology and financed by the Swiss and Indian government. Doris has a background in research. She was working ten years with molecular markers as a tool to improve forage crops, characterize the diversity and potential of landraces as well as to explore the prospects of plants in adaptation to climate change. Luis Goulao holds a post-graduation in Sustainable Agriculture and a PhD in Agronomic Engineering. He is currently a researcher at the BioTrop Centre of the Tropical Research Institute in Lisbon, Portugal. He is the head of the Agri4Safe Group, which is targeted to Agricultural Research for Development (AR4D) and to Food and Nutritional Security issues. He is also an invited lecturer at the Centre of Biotechnology of the Eduardo Mondlane University, in Maputo, Mozambique. Over the last five years he has been working in collaborative research activities with African Portuguese Speaking Countries in characterization and exploitation of plant genetic resources and in postharvest, with emphasis on native species. A focus is put on linking AR4D with agribusiness. Didier Pillot is an agro-economist by training. Over the past twenty years, he worked on agricultural development and natural resource management in contexts of transition, largely in the Caribbean and in South-East Asia. He currently coordinates Agris Mundus, a Master of Sciences in Sustainable Development in Agriculture offered jointly by six European Universities, and contributes to a number of research and support projects in higher education for Agricultural Research and Development in Africa and Asia.Since 2013, he has also been in charge of extending the international networks in Higher Education at Agreenium, the new French Consortium for Higher Education and Research in Agriculture.Didier Pillot is currently vice president of AGRINATURA – The European Alliance on Agricultural Knowledge for Development and of GlobalHort, the Global Initiative in Horticultural Sciences. Karla U. Krieger graduated in comparative literature and applied linguistics at the University of California in 1984. In 1992, she received the doctor of philosophy at the University of Vienna. After an initial post at the Austrian Agriculture Ministry, she transferred to the Ministry of Foreign Affairs, where she was responsible for development cooperation programs in the West-Africa and Sahel region. Internationally, she served as country director of the Austrian Development Cooperation in Cape Verde and Senegal, and as program manager for the European Commission in Brussels and in the Central African Republic. In over 15 years of experience in development cooperation, she has worked mainly in the area of natural resource management and its impact on national economies and societal evolution, as well as on related issues such as climate change mitigation and adaptation, extractive industries, and rural development. Currently, she is again working in Austria at the Federal Ministry of Agriculture, Forestry, Environment and Water Management of Austria, where she is managing various European research projects on agricultural research for development, GMO risk assessment, and integrated pest management.Thematic focus is on the geopolitics of West and Central Africa, sustainable development, European development policy post-2015, research and training policy, and bio-economics. Fr. Paul Varghese Moonjely is an established entrepreneur and a development leader with more than 25 years of experience in the field of social work and community development. He is currently the Assistant Executive Director of Caritas India, the official national organisation of the Catholic Bishops’ Conference of India for social development. He holds double masters degree in social work and management. He has served as the Executive Director of Welfare Services Ernakulam for more than 11 years where he has pioneered many innovative initiatives for smallholder farmers. He has been the founder trustee of the Indian Farmers movement (INFARM) and the Founding Director of Wesco Credit, a micro credit initiative rated in Crisil International with seventy thousand members in the organisation. Torsten Berg works primarily on research internationalisation and strategic research management with Aarhus University’s food and agriculture research environments and the Danish Centre for Food and Agriculture. From agenda setting to research interest to matchmaking to funding and institutionalization – with particular focus on BRICS and developing countries. Board member, AGRINATURA. Academically preoccupied with the commons, rural development and rural livelihoods in the context of the social, political and economic processes that affect the access, use and control of natural resources, particularly water. Has spent much of his adult life in Asia, as a consultant/adviser/researcher in the areas of irrigation, water & sanitation and rural electrification. Having trained as a food scientist specializing in fish protein biochemistry, Professor Guy Poulter spent much of his early career helping smallholder farmers and fishermen in developing countries access markets for their products. With experience of subsistence farming and fishing in Africa, Asia, Latin America and the Pacific Islands he spent extended periods working as a senior adviser for major development agencies such as DFID and the European Commission. He played a significant role in the development of pan European strategies on agricultural research for development and is a founder member of the UK Forum for Agricultural Research for Development and the AGRINATURA European Economic Interest Group where he is now Director. He also acts as an ambassador at large for NRI and as an Advisor to the UK All Party Parliamentary Group on Food and Agriculture for Development. Judith Francis Judith is also one of the speakers. Please see detailed information in the Speakers´ section above. You will find more information on how to reach the venue and accommodation close to the venue in Practical information tab. You get to Subway Station Wien Mitte, where you are close to the inner city. You find BOKU – Festsaal here. The complete list of recommended hotels for BOKU guests can be found here. Please ask for special tarif for BOKU guests. Please contact Tamara Wendl (tamara.wendl@boku.ac.at) if you need further help with accommodation or local transport. The fee includes coffee, tea and lunch breaks and the evening reception. The AGRINATURA General Assembly is open to AGRINATURA delegates only. Attendance of the General Assembly is free of charge. After registration you will be advised on a bank account details to transfer the fees for conference attendance. Please organize your own travel and accommodation. We assist you with a list of hotels (see Practical information) and regular Programme updates. Is assisting in the recruitment of conference speakers/contributors and in contentually designing the program. Is supporting the recruitment process of conferencespeakers/contributors and helps to shape the conference program.